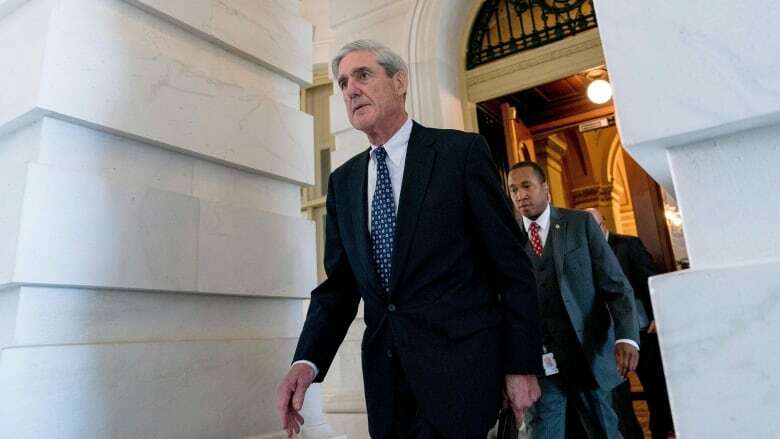 Special counsel Robert Mueller turns over his long-awaited final report on the contentious Russia investigation that has cast a dark shadow over Donald Trump's presidency. The report will now be reviewed by U.S. Attorney General William Barr, who has said he will write his own account communicating Mueller's findings to Congress and the public as early as this weekend. "I am reviewing the report and anticipate that I may be in a position to advise you of the special counsel's principal conclusions as soon as this weekend," Barr said in his letter to the top Republicans and Democrats on the House and Senate judiciary committees. The comprehensive report — still confidential for now — marks the end of Mueller's probe but sets the stage for big public fights to come. It's not known whether Mueller's report answers the core questions of his investigation: Did Trump's campaign collude with the Kremlin to sway the 2016 presidential election in favour of the celebrity businessman? Also, did Trump take steps later, including by firing his FBI director, to obstruct the probe? 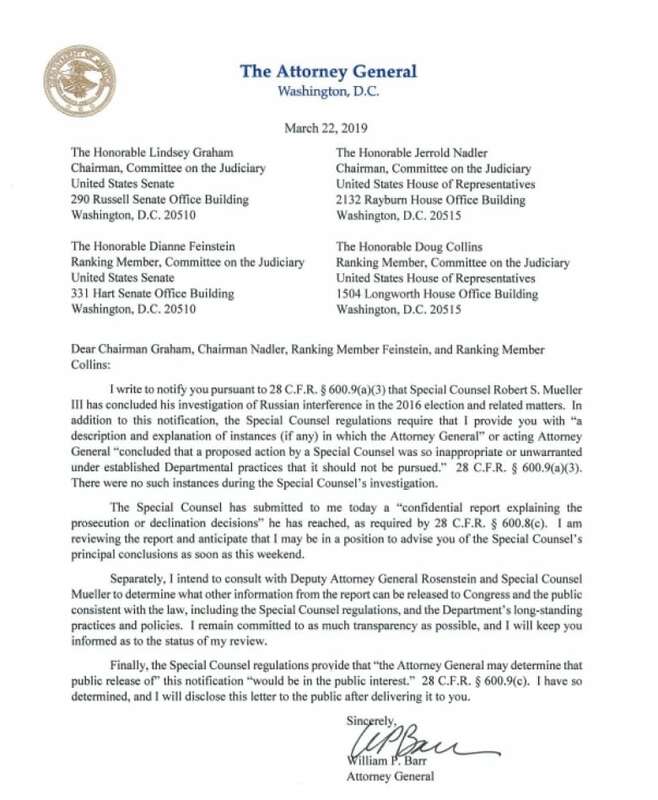 Senate Judiciary Committee Chairman Lindsey Graham expects that he and the panel's top Democrat, Sen. Dianne Feinstein, will be briefed "in the coming days" about Mueller's report. The Democratic chairs of six House committees are demanding that the Justice Department release the full report "without delay." 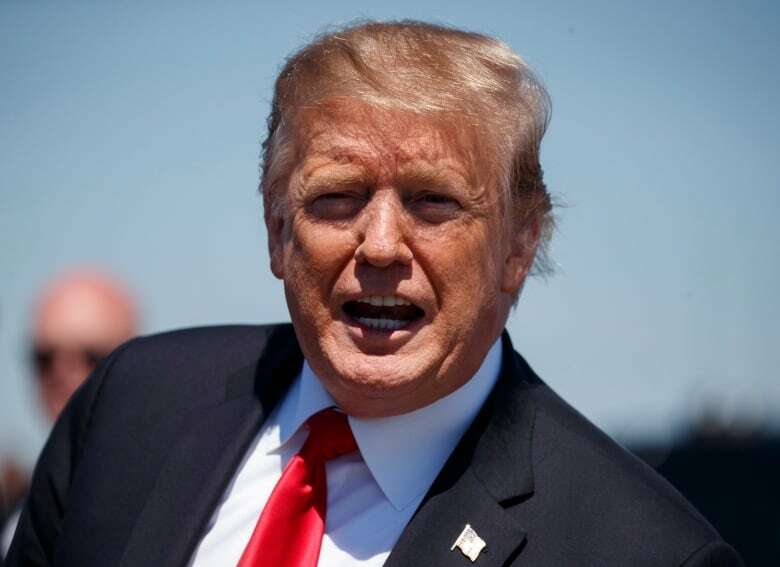 The Democrats say since the Justice Department asserts a sitting president can't be indicted, Barr's failure to release evidence of criminal or other misconduct by President Trump "would raise serious questions about whether the Department of Justice policy is being used as a pretext for a cover-up of misconduct." One top Republican, Sen. Chuck Grassley of Iowa, said the findings of the special counsel's Russia investigation must be made public to end the "speculation and innuendo" that hangs over Trump's administration. The former Judiciary Committee chairman said while it's clear the Russians "tried to meddle in our democratic processes," he still hasn't seen any evidence of collusion. When the Justice Department announced the arrival of Mueller's report, Trump was at his Mar-a-Lago property in Florida. His lawyers say they are "pleased" Mueller has delivered his report. "We're pleased that the Office of Special Counsel has delivered its report to the Attorney General pursuant to the regulations. Attorney General Barr will determine the appropriate next steps," said Rudy Giuliani and Jay Sekulow in a joint statement. 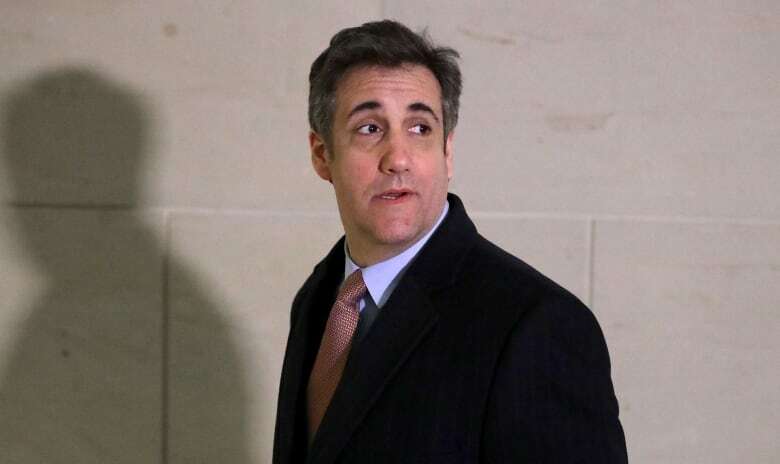 Along the way, Trump lawyers and advisers repeatedly evolved their public defences to deal with the onslaught of allegations from the investigation. Where once Trump and his aides had maintained that there were no connections between the campaign and Russia, by the end of the probe Giuliani was routinely making the argument that even if the two sides did collude, it wasn't necessarily a crime. Equally central to Mueller's work is his inquiry into whether the president tried to obstruct the investigation. Trump, facing political peril from the inquiry, has used Twitter, campaign-style speeches and comments to news media to assail Mueller, accusing him of running a politically motivated, "rigged witch hunt," going "rogue," surrounding himself with "thugs" and having conflicts of interest. The president, speaking to reporters on the White House lawn before leaving for meetings at his Florida estate, again repeated his claim that: "There was no collusion. There was no obstruction. Everybody knows it. It's all a big hoax. It's all a witch hunt." “The reason we have the Special Counsel investigation is that James Comey (a dirty cop) leaked his memos to a friend, who leaked them to the press, on purpose.” <a href="https://twitter.com/KennedyNation?ref_src=twsrc%5Etfw">@KennedyNation</a> Totally illegal! But Trump also took certain acts as president that caught Mueller's attention and have been scrutinized for possible obstruction.